Pine Siskins Spotted in Maryland! 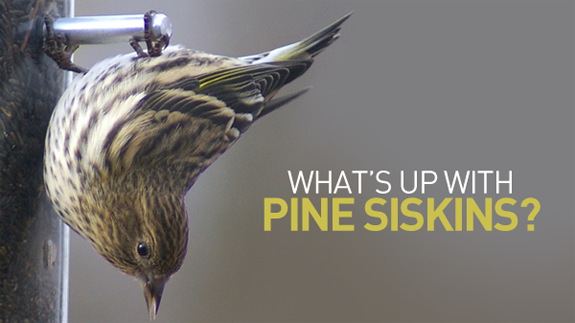 Birders in Maryland are spotting Pine Siskins at their backyard feeders! This is exciting news, because we don’t see them in our area every winter. Where are they usually? It depends. These Northern finches are tiny nomads who follow food availability which can vary widely from year-to-year, depending on how weather has affected pine tree seed production. Here’s an excellent explanation of climate-driven bird migration, with Pine Siskins as the focus. Have you seen Pine Siskins flocking to your feeders? They are truly fun to watch—and to hear! The Pine Siskin is smaller, with distinctive yellow markings and a sharp, pointy beak. Pine Siskins are not as vividly hued as Goldfinches, being mostly streaky brown with more subtle yellow markings on the edges of tails and wings. Look for flashes of yellow as they flutter around your tree branch tips. If you don’t spot yellow, you might confuse them with female House Finches. [See image below.] However, Pine Siskins are up to an inch smaller with slimmer and uniquely shaped pointy bills, short forked tails and pointed wingtips. Zhreeeee! Pine Siskins forage in small tight flocks and vocalize constantly to each other— during flight, while they’re foraging, while they’re doing just about everything except sleep! They have a very distinctive “wheezy” or nasal call, and punctuate their songs with a noise sometimes described as a harsh, ratchet-y “watch-winding” sound. And, we’re not kidding, it is non-stop!!! Listen to the Cornell Lab‘s Pine Siskin recordings. Like American Goldfinches, Pine Siskins will feed upside down! Your best bet to lure these entertaining guests to your backyards, is to stock feeders with nyjer (thistle) or a nutritious nyjer blend that includes fine sunflower pieces, like our Finch Favorite. The Bottoms Up Feeder by Droll Yankees is perfect and will keep pesky house sparrows at bay. If you haven’t cleared out your garden yet, you may also see them seeking weeds with seed heads, like dandelion. However, you are not likely to see a Pine Siskin hopping along the ground. Look for them clinging to the tips of conifer branches, picking through cones for tasty seeds. Tempt them with a bird bath or fountain kept fresh and filled. With temperatures beginning to drop, make sure your bird bath water remains ice-free and accessible. We just can’t emphasize this enough: For wild birds, access to water is critical during every season. 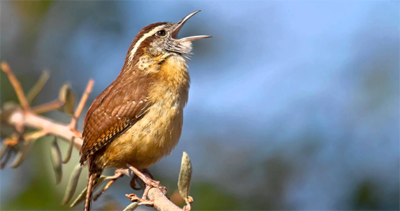 See Wild Birds, Winter and Water for tips and more. In a year when we see Pine Siskins in our area, it’s not unusual that other Northern Finches such as, Common Red Polls and Purple Finches will also make an appearance. So keep your eyes open and your feeders full! If you don’t spot the yellow markings right away, you might confuse the female House Finch with the Pine Siskin. 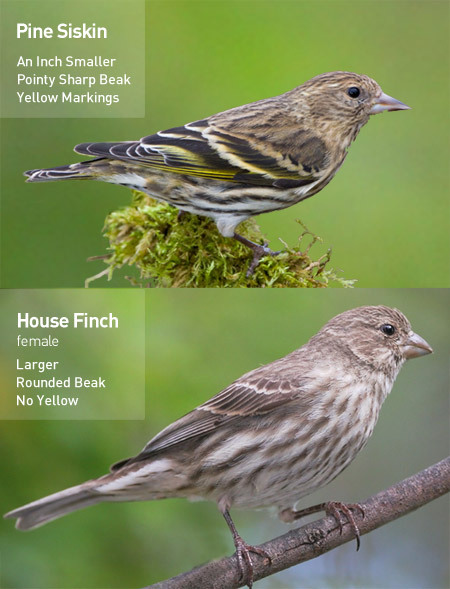 Consult the Audubon Guide for North American Birds for the Pine Siskin and House Finch reference pages for more photos and info. If you’re looking for a field guide, we stock a wide range of the best, most up-to-date field guides available and can help recommend the right field guide for all levels of birding and all ages of birders, too.. Pass along the good news! Let all the other Pine Siskin fans know if you’ve spotted them in your backyard. Please share your sightings with us at the store or on The Backyard Naturalist Facebook page. 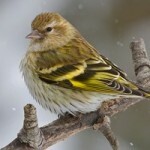 This doesn’t happen every winter, so enjoy the Pine Siskin show while you can.